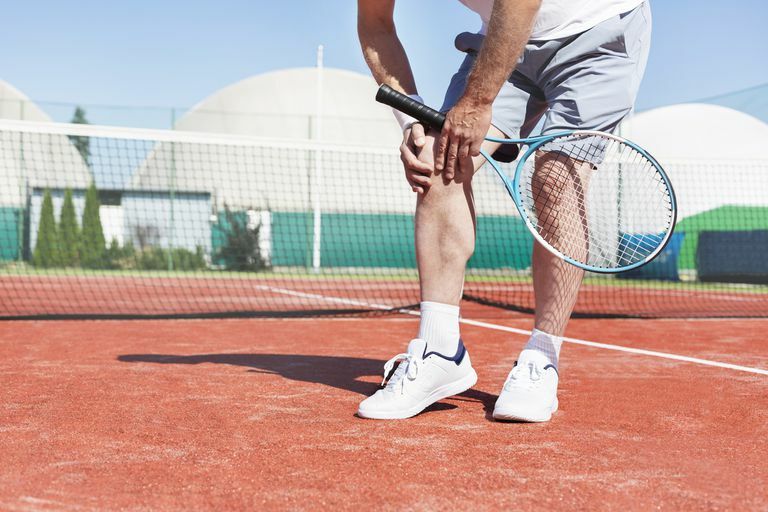 The sensation of knee instability or weak knees, which many describe as the knee "giving out," may occur suddenly or develop gradually over time. It may be the only symptom of a problem or be accompanied by signs such as popping, locking, pain, bruising, or swelling. The possible causes include damage to one of the knee ligaments, a meniscus tear, arthritis, patellar (kneecap) instability, or even nerve damage. If your knee feels unstable it's important to see your doctor, who can then perform an exam and order imaging studies. In order to understand any knee symptoms you are experiencing, as well as the potential causes, it's helpful to briefly review the anatomy of the knee and how it functions. The knee is a hinge joint with roles limited to flexion and extension of the knee, and that connects the large thigh bone (the femur) to the shin bones (the tibia and fibula). Ligaments connect bones to bones and play a large role in stabilizing the knee and keeping the bones in line. An injury to any of these ligaments can lead to instability. There are four major ligaments in the knee, as well as some minor ones. There are two collateral ligaments, an anterior cruciate ligament, and the posterior cruciate ligament. The collateral ligaments are located on either side of the knee and limit sideways bending. The medial collateral ligament (MCL) is on the inner side of your knee and the lateral collateral ligament (LCL) is on the outer side of your knee. The anterior cruciate ligament (ACL) connects the top of the tibia near the front (anterior) to the femur at the center of the knee. It limits rotation and forward motion of the tibia. The posterior cruciate ligament (PCL) connects to the top, rear of the tibia to the femur and limits backward motion of the tibia. The cartilage pads known as menisci, are the "shock absorbers" of the knee and are located between its femoral and tibial components. Each meniscus cushions the knee joint and also plays a role in stabilizing it. Injury to one or both menisci increases instability. Other structures within the knee are easiest to picture by looking at images of the knee. You may notice that your knee suddenly goes out on you completely or that you experience a sensation that it may buckle that develops gradually over time. Having your knee go out can cause complications on its own (such as a fall or the need to have surgery for a torn ligament), but long-term instability that is less dramatic (so that it can be ignored and go untreated) can lead to complications as well. A 2016 study found that older adults with arthritis who had untreated knee instability were more likely to have falls, sustain fall-related injuries, and have significantly poorer balance confidence than similar adults who received treatment for their knee condition. If you are experiencing the sensation of your knee giving up, you should see your doctor. You should seek immediate medical care if you are having severe pain, if your knee is bruised-looking, you experience locking or a popping sensation in your knee, you have significant swelling, or develop a fever. Damage (either partial or complete tears) to one or more of the four ligaments in the knee is a common cause of knee instability. Some, such as complete ACL tears, often occur suddenly with a sensation of the knee going completely out. With PCL tears, the knee doesn't usually "give out," per se, but it feels like it could. ACL tear: An ACL tear usually occurs with sudden movements, such as a change in direction during sports. It is more often a non-contact injury, in which a person may hear a pop while pivoting or landing after a fall. It may also occur with a motor vehicle accident. The giving out sensation is often followed rapidly by pain and swelling. ACL tears are much more common in female athletes than male athletes. PCL tear: PCL tears may occur during a fall in which a person lands directly on the front of the knee. They may also occur when the shin is forcefully hit from the front. These tears have been coined "dashboard injuries," referring to hitting the front of the lower leg on the dashboard of a car in a motor vehicle accident. A PCL tear is often associated with injuries to other ligaments and/or menisci. MCL tear: MCL tears usually occur with lateral forces—when the outer side of the knee is hit, such as with clipping in football. If knee instability is present, it usually implies a significant MCL tear is present. Pain, bruising, swelling, and difficulty bending the knee are common. LCL tear: An LCL tear usually occurs with excess pressure on the inside of the knee or excessive inward bending of the knee, such as with quick stops (for example, with skiing or soccer) or collisions (with hockey and football). As with MCL tears, a feeling that the knee will give out often implies a significant injury. A meniscus tear may occur with activities such as twisting, turning, pivoting. Symptoms such as stiffness and pain usually begin rapidly and may be accompanied by a pop and locking sensation. Meniscal tears are more common in people over the age of 30, as the menisci are more resilient in younger people. With a torn meniscus, the sensation of a knee going out is often more related to pain than a true instability of the joint. There are many degrees and patterns of tears that are of different significance with regard to symptoms and treatment. The patella (kneecap) is attached to ligaments and tendons that serve to stabilize it. Specifically, it lies within the quadriceps tendon, which anchors the quadriceps muscle to the upper tibia (shin bone). Normally, the kneecap glides through the patellofemoral groove, a track in the front of the femur (thigh bone) at the knee. Patellofemoral ligaments act as secondary ligament stabilizers from the sides of the patella. A direct blow to the kneecap, usually from an accident or sports injury, can dislocate it from this groove—a condition known as patellar instability. An unnatural twisting motion of the knee can have the same result. Patellar dislocation (partial or complete) may result, which increases instability. Plica syndrome is a condition that results from inflammation of the inner lining (synovial tissues) of the knee joint. It may occur suddenly with movements such as bending, or it may occur more gradually as part of an overuse syndrome. Plica can cause symptoms similar to a meniscal injury, including the sensation that a knee is about to go out. Worn and uneven cartilage due to osteoarthritis of the knee is also associated with instability. This may because of several problems that are seen in osteoarthritis, such as loose cartilage bodies inside the joint, degenerative meniscus, and ligament tears. Loose bodies are small fragments of calcified cartilage that can become caught between the bones of the knee, in the joint space, causing sudden pain and possibly causing the knee to give way. Aside from causing the joint to give way, loose bodies in the knee can also cause locking or may interfere with straightening of the leg. Even if the loose bodies have been detected on imaging studies—X-rays, magnetic resonance imaging (MRI), or computed tomography (CT scan)—the instability they may cause is somewhat unpredictable. Knee arthritis often causes pain with movement, joint stiffness, reduced range of motion, and a sticking or grinding sensation when walking. Inflammatory arthritis may also be to blame for knee instability. Neuropathy in the femoral nerve can disrupt normal sensations, making it feel like your knee could go out or is going out. There are a number of conditions associated with nerve damage, including diabetes, chronic alcohol use, and multiple sclerosis. In addition to changes in sensation or numbness, femoral nerve neuropathy may cause tingling or burning pain in the area around the knee. A careful history is a first step in evaluating a knee that goes out. This includes noting what was happening when symptoms began and any past history or risk factors for knee problems. Special tests (such as McMurray's test and Ege's test) are then done to examine for meniscal tears and to evaluate the ligaments. For example, side-to-side movements are performed to test collateral ligament stability, and an anterior and posterior drawer test and Lachman test are done to evaluate the ACL and PCL. The choice of imaging tests depends on the suspected problem. X-rays may be helpful (for example, finding calcium deposits in the MCL), but a knee MRI is often the test of choice for identifying soft tissue injuries such as ligament and cartilage injuries. The treatment of knee instability and the sensation that a knee is giving out depends very much on the specific cause of the symptoms. The overall goal is to treat pain, restore strength, and restore the function of the joint. Treatments may include RICE (rest, ice, compression, and elevation) and nonsteroidal anti-inflammatory medications for pain. Conditions such as a torn ACL or torn meniscus often require knee surgery, but other conditions may benefit more from physical therapy and knee rehab exercises. A knee brace or immobilizer may also be used in some cases. Knee conditions that have not been addressed increase the risk of the conditions that lead to instability, so it's important to see your doctor with any knee symptoms at all. With athletes, greater attention is now being given to ACL tear prevention, especially in female athletes. The 15-minute ACL prevention program, which includes plyometric exercises and balance drills, was designed to reduce the risk of these tears in teens. Athletes should also rethink playing year-round sports and avoid playing when they're ill or not adequately rested. In some cases, and with some sports, wearing a knee brace may reduce the risk of a knee injury. For those who have leg muscle weakness, a strengthening program may reduce risk, and avoiding overuse injuries is important for everyone. Finally, wearing a seatbelt is an easy way to reduce your risk of a dashboard injury (PCL) should you have a car accident. The sensation of having your knee give out can be challenging to diagnose, as there are many potential causes. Fortunately, there are also many different treatment options that can restore function and reduce pain. It's not uncommon for people to ignore this symptom or to dismiss it as a normal part of aging. Doing so, however, can increase your risk of other problems down the line. Make sure to visit your doctor to get an accurate diagnosis and treatment plan. Kasper, Dennis L., Anthony S. Fauci, and Stephen L. Hauser. Harrison's Principles of Internal Medicine. New York: Mc Graw Hill education, 2015. Nevitt, M., Tolstykh, I., Shakoor, N. et al. Symptoms of Knee Instability as Risk Factors for Recurrent Falls. Arthritis Care and Research. 2016. 68(8):1089-1097. Do Noisy Knees Mean You'll Develop Arthritis? What's to Blame for Arthritic Joint Locking?